We are proud to present this year’s graduates of McGrath Auto’s Emerging Leaders program! The program identifies talented employees with management potential and leads them on a year of growth, improving leadership skills along the way. Read more to meet our next generation of leaders! With 94% of the company’s manager positions currently held by employees who have worked their way up, we want to keep that tradition going! We want employees that we already employ to reach their potential and become the very best they can possibly be. It’s the culture here at McGrath Auto. During the application process less than half that apply are selected to participate. Once inducted, the next generation of leaders undergo weekly mentorship meetings, are provided personal reading material, attend leadership seminars and learn improvisation skills. The program immerses employees in a culture of leading and self-motivation, that not only improves the individual employee, but also everyone surrounding them. Last week we held a reception to honor those that completed the 2015-16 course in downtown Cedar Rapids. 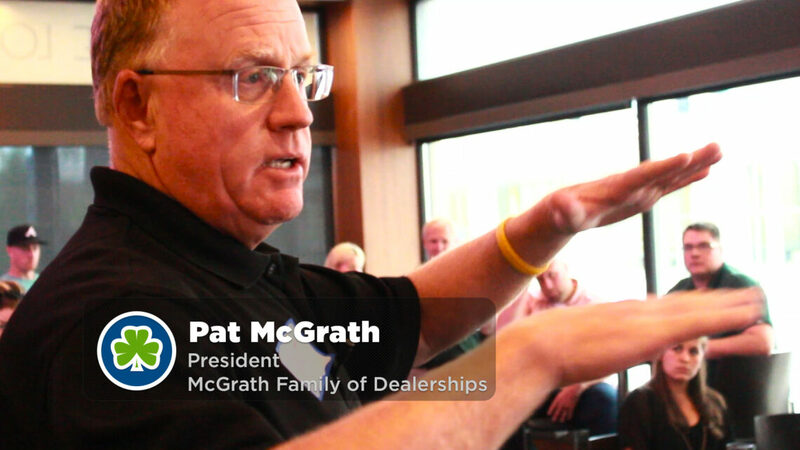 Here McGrath Auto President Pat McGrath speaks on what he believes it means to be a leader, before presenting our recipients with their certificates. More good news! The McGrathy Family of Dealerships is still seeking emerging leaders in 11 surrounding Iowa Communities! If you think you have what it takes to thrive in a family environment, that cares deeply for employee happiness, please check out the following locations and apply today! Pat McGrath Chevyland, Pat McGrath Dodge Country, McGrath Powersports and Westdale Used Car Superstore of Cedar Rapids. McGrath Kia, McGrath Buick GMC Cadillac, and McGrath Volkwagen of Hiawatha. Marion Used Car Superstore. McGrath Harley Davidson and McGrath Volkswagen of Dubuque. McGrath Hawkeye Harley Davidson and Coralville Used Car Superstore. Check out the next generation of leadership in the local community. Feel free to click to learn more about each of our valued employees! Thank you to this year’s recipients for your hard work, perseverance, and growth!